The Springfield College community-engaged student employment program employs students in the following service programs. Most hiring and placement for these positions occurs during the beginning of the fall semester, but there may be vacancies during the year. The America Reads Challenge is a grassroots national campaign that challenges every American to help all our children learn to read, including English language learners and student with disabilities. At Springfield College, more than 150 students participate in this challenge by tutoring and mentoring youth at elementary schools and after-school programs in the city of Springfield. Springfield College students currently serve at the following schools and after school programs. To volunteer or apply for a work study position, contact the Center for Service and Leadership at (413) 748-3394. Training and orientation for the sites are required. If transportation is needed, all efforts will be made to arrange for carpooling with other volunteers. Springfield College and Elias Brookings Elementary School (a five-minute walk from our main campus) have an after-school initiative focused on the enhancement of literacy and math skills for elementary school students. This after-school program includes students in K-5 grades and has three goals that guide the direction and focus of its programming. Help students at Brookings improve their comprehension and application of basic reading and math skills that will improve their MCAS scores. Create a space for positive social interaction and relationship development, both student to student and student to mentor. Work with students to create enrichment activities that will enhance their learning while participating in music, art, drama, and recreation. If you are interested in joining this program or simply have some questions, please contact the Center for Service and Leadership at (413) 748-3394. This is a unique collaboration between Springfield College and Springfield’s DeBerry and Brookings elementary schools. 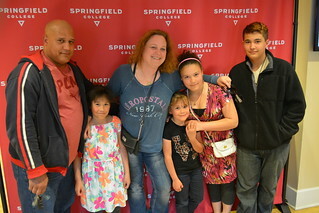 Participating Springfield College students are paired with an elementary youth one day per week for several hours to work on academic achievement and participate in recreational or arts-related activities on the Springfield College campus. The Partners Program is a student-led initiative, with student site coordinators planning the week’s events and overseeing the activities under the supervision of a graduate associate. Since the program’s inception in 1993, more than 1,500 Springfield youth and Springfield College partners have shared time together and learned from one another. For more information, contact the Center for Service and Leadership at (413) 748-3394. The Homework Heroes program brings area youth to campus after school during the week for homework help. Springfield College students offer one-to-one academic tutoring, as well as support in MCAS preparation. The Federal Community Work-Study Program was created by the federal government in 1964 for part-time employment for low-income students. Colleges and universities are now required to use a minimum of 7 percent of college allocated federal work-study funds to engage students in community service programs and to operate literacy programs. Springfield College sets aside 25 percent of its work-study funds for community service programs.